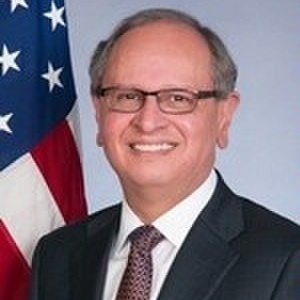 Arnie Chacon, Director General of the Foreign Service and Director of Human Resources at the U.S. Department of State, was the first generation in his family to graduate from North High School in Denver. He became a Boettcher Scholar at the University of Colorado in Boulder, and chose a career with the State Department because of his undergraduate experiences. This week at the GlobalMindED Conference, Arnie will give the welcome address to all attendees during the opening reception, 5-7pm June 8 at the Sheraton Downtown Denver. We are honored to have him launch our second annual event. As a first-generation student, who or what inspired you to aim high, stay focused and persist? I would have to say my parents. They instilled in me, from a very young age, a profound appreciation for the value of hard work, drive and determination and a belief that, combined with a solid higher education, these qualities would enable me to get ahead and forge a better future for myself--in short, to live the American dream. The concept of grit is once again fashionable in the world of psychology as a critical element of personal and professional success. My parents' generation knew that intuitively and they passed on these, you might say, more old-fashioned values to their children. There were also teachers and mentors along the way at Beach Court Elementary, Skinner Junior High, and North High School that helped channel my interests in the right direction and identify options and opportunities I might not have otherwise discovered. I owe them a debt of gratitude. There is no more noble profession than that of teacher and educator. When you hit roadblocks in high school and then college, how did you respond? You always hit roadblocks in life. Not necessarily at every turn but certainly along the way. My experience was no different in that sense. What's important and ultimately decisive is how you respond to them. We're human beings and our first reaction to life's challenges is often disappointment. But then you figure out what you need to do to overcome the particular hurdle and you pick yourself back up and move forward. It's trite but no less true and it's a lesson I share with aspiring diplomats, students and my own children: it's not how about how many times you fall down; it's about how many times you get back up. Roadblocks and setbacks are great teachable moments. If we allow ourselves to be open and vulnerable enough to absorb what life is trying to teach us, we will be stronger for it. How did you know international relations was right for you? I often share this story with students to illustrate the importance of keeping an open mind about career and life options. Like so many first-generation students I didn't know what I didn't know. My family was among the first Spanish/Mexican settlers in New Mexico and Colorado. For generations few ventured outside the area. So really nothing in my background and upbringing would have suggested that a career in international relations or diplomacy was in my future. The one thing I knew is that I wanted to make a difference. What better way to help people and make a difference, I thought, than to be a medical doctor. But one lucky summer I had the chance to do public health volunteer work in Central America through an NGO. It was an eye-opening and life-changing experience. I made use of my Spanish language skills, met U.S. diplomats and aid workers who were working to bring greater opportunities to these countries, and witnessed the efforts of churches and NGOs to help people in desperate poverty. They were making a difference--and most of them weren't doctors. So instead of going to medical school, I changed my major to international relations and ended up joining the Foreign Service. I never looked back. I've had the chance to work in Latin America and Europe, at the United Nations... It's been a privilege to serve as the U.S. Ambassador to Guatemala, and now I'm grateful for the chance to give back to the institution that gave me these opportunities as Director General of the Foreign Service and Director of Human Resources. Life can bring happy surprises, but you have to be open to receiving them. How has the first-generation experience helped you to be effective in your various roles and responsibilities? First-generation students have unique challenges, but also unique strengths. One of those is a powerful desire to do well in whatever you take on, to persist in the face of challenges and ultimately master or become proficient in the skills and competencies necessary to carry out a particular role. Having said that, you don't always succeed. But that's how you know you're really stretching yourself. If everything comes easily, you're probably not growing or fully realizing your potential. There's no generational cut-off for talent, creativity or dogged persistence, but there's no doubt first-generation students, like first- and second-generation Americans, are fiercely passionate in their commitment to the values and ideals that have made this country great. You can't afford to be cynical when your livelihood and future rests on what you make of the opportunities presented to you. What advice do you have for first-generation freshmen? Focus. Study. Apply yourself. Persevere. Never give up. Put in the hours. Stretch yourself: Don't be afraid to sign up for challenging courses if the subject matter interests you. Take advantage of opportunities to do a semester abroad or volunteer work overseas. It will broaden your perspective and give you a better sense of the world around you. Seek out mentors: Cultivate relationships; build a support network to get you through the challenging times and keep you honest. Be a mentor yourself. Help others and give back to your community. Know yourself: Be self-aware but also attuned to others. And treat them with the same dignity and respect with which you wish to be treated. The number one predictor of success is not traditional intelligence or IQ; it's emotional intelligence and interpersonal skills. Work on it from day one. And don't forget to enjoy the experience. It will go by much faster than you think. How can high school and college faculty/administrators better promote access and equity for a diverse talent pipeline? Outreach, outreach and more outreach--early and often. Collectively, our institutions have to do a better job of starting the work of engaging diverse students and historically underrepresented groups much earlier in a child's life and of reaching out to kids and families wherever they are. This means getting to elementary and middle schools, not just high schools. We've got to plant the seed early. That's why our long-term recruitment efforts at the State Department involve outreach to schools. In the past year, I've visited several majority minority middle and high schools across the country--as have members of my team and other senior Department officials--to demystify our work and mission. What have you learned, serving in various countries such as Honduras, Mexico, Italy, Chile, Peru, Ecuador and Guatemala? I learned a great deal. But I think the fundamental lesson is that we all want the same things--the opportunity to make a decent living doing meaningful work, the ability to provide for our families and ensure our children have the chance to do better than we did, and a responsive democratic government that can provide security and a level playing field. We have more in common than not. At the same time, we need to understand the cultural nuances of each country, the history, traditions and sensitivities so we can be effective interlocutors. In our globalized world, international issues are increasingly domestic issues (immigration, for example) and impact all of us daily. Why should first-generation students consider a career at the State Department or public service more broadly? It is all about opportunity and service. It would give them the opportunity to serve their country and make a difference at a time of dizzying change, to discover new places, learn new languages and immerse themselves in a different culture--while at the same time representing the United States. I could think of no higher honor or privilege than to serve our country. While the Foreign Service is the most well-known, the Department offers several career tracks--Foreign Service (which includes both generalists and specialists) and Civil Service are the principal ones. But where we have the greatest need is in the area of consular services and certain specialist areas. Each has its own selection process and path. To address the growing need for consular services (we granted 10 million non-immigrant visas in 2015), we've created the Consular Fellows Program. It is a 3-5 year paid national service program that gives qualified candidates the opportunity to use their language skills in Spanish (or Mandarin, Portuguese and soon Arabic, Russian and French) while doing critical consular work in our embassies and consulates all over the world. New hires who commit to a four-year service agreement will be eligible to receive a recruitment incentive of up to 10% of their basic salary. Consular Fellows may be eligible to participate in the Student Loan Repayment Program (SLRP). Through our Pickering and Rangel fellowships, the Department is working to provide opportunities for Americans of diverse backgrounds to pursue a career in the Foreign Service. The Pickering and Rangel programs are the Department's premier talent acquisition programs. In 2015, for example, Pickering and Rangel fellows comprised close to 20% of new Foreign Service Officer hires. We also have internship opportunities year-round, some of which are paid. I encourage interested students to visit our website, careers.state.gov, for more information on all of these opportunities. Thank-you to Director General Chacon for sharing his personal insights and professional expertise. He reflects the commitment to excellence and collaboration that everyone at the conference shares, and his presence will undoubtedly inspire the talented first-generation student attendees to join the Civil or Foreign Service. GlobalMindED is proud to have Director General Chacon as part of our movement.